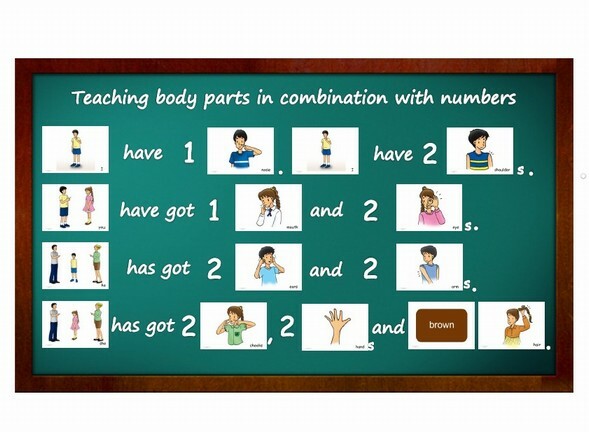 Introduce body parts vocabulary to students and ask random questions such as: What is it? What colour is it? How many ….. do I have? Focus on singular and plural body parts, for example one eye – two eyes. Make sure to add “s” to plural body parts. Create a small picture story on the board without adding the flashcards, just the numbers and pronouns as a master form. Let students choose what vocabulary cards must be inserted in the blank space, related to the number in front. Hand to hand - Divide students into pairs. Let students stand up and facing each other. Teacher gives commands like “hand to hand”, shoulder to shoulder”, “foot to foot”eg.. Students have to follow and put their hands, shoulders or feet together. Slowest pair must sit down. The last standing pair wins.